Now here's a guy I can sympathize with. It's bad enough when a sign is misspelled. 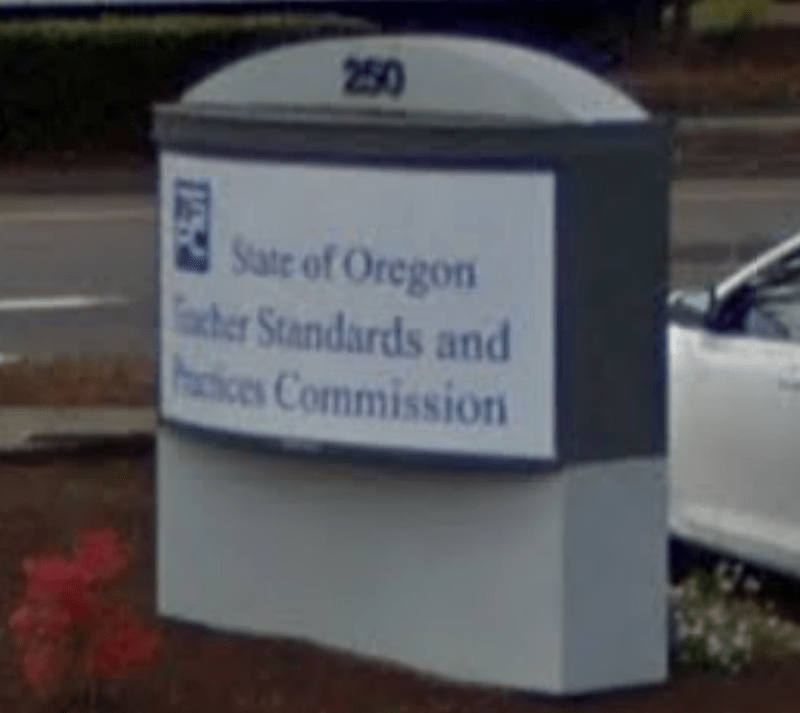 It's much worse when the misspelled sign is the sign for my state's Teacher Standards and Practices Commission, for God's sake, which gives out teacher's licenses. But when the bomb-making instructions I download to blow up that sign are also full of typos, and then my bomb doesn't work—well, that's just, I don't know what. I'm thinking, the bomb fails, and at that point he does a slow-burn glare into the camera accompanied by either <sad trombone sound> or <boing!> Either one works, I think. Let me digress here for a second and just marvel at the fact that Google Street View exists. The Statesman-Journal has a picture of the misspelled sign, but it's their picture; they have a link where I can buy it, but I'm too cheap for that yet I don't want to infringe. But the sign is sitting out there in public and anyone can take their own picture of it if they want to. Google, of course, has taken a picture of the whole neighborhood (and everybody else's too, probably). So I took it as a challenge to find an image of the misspelled sign. And I did, but unfortunately <sad trombone sound> it was not misspelled at the time Google was there. This is the same sign pictured in the Statesman-Journal article, and as you can see the "D" is clearly present. What that means, of course, is that they originally got the sign right. The letter wore off or fell off or somebody scraped it off, and maybe the only way this story could get better is if the bomber's fingerprints turn out to be on the sign, suggesting he created the typo himself to have a pretext for his pro-literacy attack. Anyway, let's get back to the receptionist, who at this point is still staring at a pressure cooker with wires sticking out of it. This area must also be visible to other employees, because the commission's executive director saw him come in and knew he was trouble. "He walked quite confidently into our office as though he had a mission," she said, "and I think that was what alarmed me right off the bat." (Because no one who wants to be a teacher comes in with a good attitude? My guess is that the pressure cooker with wires sticking out of it might have also played a role in her alarm.) The man explained that he was upset with their misspelled sign and had just tried to blow it up for that reason. Didn't work, and you know what else? After discussing his failed attempt to detonate his bomb, the man complained that the instructions he downloaded to make the bomb also had misspellings. [According to the director, he] implied that [she] and her employees should be concerned about the level of education children receive, given that his [bomb-making] instructions were rife with errors. I think that only follows, though, if these were official State of Oregon bomb-making instructions that he'd gotten hold of. Then it would be fair to worry that our children are not getting the kind of training in literacy and improvised explosive devices that they will need to be successful in today's competitive economy. But if these were just any old bomb-making instructions, then the state's not to blame. You always have to be careful with what you find on the internet. This was not in fact a bomb or really an attempt at one, according to police, just a pressure cooker. And the man left after the director "motioned with her hands for another employee to call the police," which suggests to me she didn't see him as too much of a threat if she was doing that right in front of him. And she did "focus on the idea that, if he was holding the bomb, then perhaps it wasn't going to explode immediately." Still, it's good to be careful. Police found the man sitting in a van nearby and arrested him. Still, the director said they would keep their doors locked for a while from now on, just in case there are any other typo-driven aspiring terrorists in Salem. The report did not say whether they have fixed the sign yet, which would be one proactive way to deal with the threat.